We all love our cats — we just aren’t the biggest fans of what they can track into the house. Between mopping up dirt and mud, picking leaves and twigs out of their fur, and applying flea medication every month, it’s easy to lose your cool over keeping your furry friends healthy. That flea collar might do well to keep jumpers off of your dog or cat, but it won’t do much against bed bugs that might latch on for a quick snack. If you’re traveling with your pet this summer, or your pet is an outdoor roamer, you need to know how bed bugs and cats mix, and what to look for if they do. Can My Cat Carry Bed Bugs? In short, probably not. While it is possible for bedbugs to hide on a pet, it’s unlikely that they’ll stick around long enough to be carried to another location. Bed bugs don’t like fur — they have a tough time maneuvering through it, and most furry animals would feel them pushing the hairs aside. Bed bugs also don’t nest and lay eggs on their hosts, preferring instead to make camp in tight cracks and crevices nearby. While their meal of choice would be a (relatively) fur-free human host, that doesn’t necessarily mean that you won’t find a bed bug on your pet. If they are hunting for food and don’t detect a human nearby, they may go for the next best thing: a snoozing cat, dog, rodent, or even a bird. However, this generally means that the bugs will only be on a pet for a few minutes before retreating to their hideout. That tight window usually won’t be enough to risk an infestation, but it’s certainly possible. Can Bed Bugs Transfer Diseases to My Pets? While fleas and ticks often spread disease through feeding and nesting on pets, bed bugs are not known to transmit any diseases. However, that doesn’t mean that bed bugs and their bites are harmless: bites can cause allergic reactions, and excessive scratches can lead to skin infections. For more information on the potential health risks associated with bed bugs, see the CDC’s Bed Bug FAQs. If you suspect that your pet has brought bed bugs into your home, it’s important that you act quickly to reduce the likelihood of their spreading. A pregnant female can lay up to 5 eggs a day, and the eggs only take about a week to hatch. Start by washing your (and your pets’) bedding in hot water, and drying in high heat if possible. Applying heat is an effective way to kill bed bugs and their eggs. 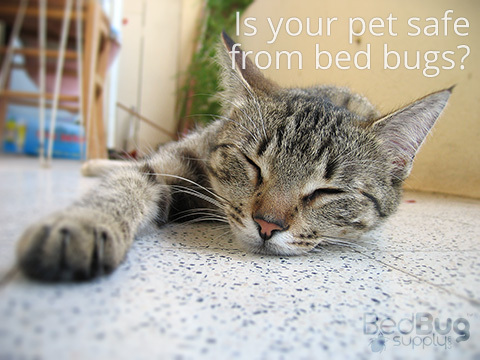 Next, vacuum your pet’s crate or carrier to pick up any bed bugs or eggs hiding in it. Be sure to get into the corners and any slots — if a credit card can fit in it, so can a bed bug. Once these preliminary steps have been taken, you can then move onto a more thorough home inspection for signs of a bed bug infestation. Bed bugs spread quickly — chances are very good that if you found them on your pet, you’ll find them hiding somewhere nearby.